Fort Collins is home to some of Colorado’s most innovative farms, outstanding farmers’ markets and landmark restaurants. These three things come together spectacularly to create farm-to-table fare driven by local produce and sustainable practices. So, when you’re looking for salads made with garden fresh ingredients and prepared with culinary prowess, it won’t be difficult to track something down. To help you narrow down the options, we created a salad bucket list of sorts. It includes places that are famous for their vegan eats, their charitable work and even a handful well-known for things like donuts, fried chicken and pot pie. Enjoy! The 415 is one of the freshest spots in Fort Collins in every sense of the word. Founded by a team of locals from the famous Rio Grande Mexican Restaurant, they brought their food prowess and hospitality expertise to 415 South Mason in 2012 and the eatery has been a neighborhood go-to ever since. Because they use local providers for both food and services as often as possible and because they keep their menu simple and true to the ingredients, you’ll always find frequent menu changes and farm fresh fare. Their menu is made up of grain bowls, veggie dishes, fried chicken and orange-infused waffles, salads, hot sandwiches, pizzas, and soups. Catering to both vegan and gluten-friendly diets, it’s the local go-to for fresh, healthy eats. 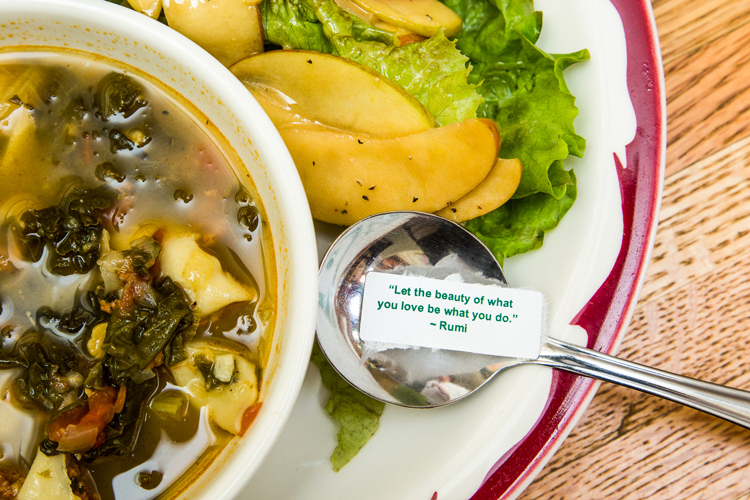 This Fort Collins restaurant serves up soup, salad and sandwiches, and the team strives to make sure you enjoy a healthy and satisfying meal every time. The menu changes daily to reflect available ingredients and changing seasons — and kids can enjoy their choice of soup or salad for under $2! With six Fort Collins locations, including two on the CSU campus, you’ll always be able to track down healthy meals and garden fresh salads inspired by the season. Even if you’re not a Fort Collins local, chances are high you’ve heard of this neighborhood eatery. Offering a rotating menu of seasonal soups and salads, the cafe operates as a nonprofit and is entirely donation based. That means you can pay $10 or under when you’re pinching pennies or pay it forward when you can! The daily menu features delicious soups, salads, breads and desserts. You can find daily, seasonally inspired menu offerings on the FoCo Cafe Facebook page. Not only does Tasty Harmony offer vegan and vegetarian cuisine, the foods and ingredients are nearly all organic, and most of the desserts are wheat and sugarcane free. Owners Sacha and Jill Steinhauser opened their restaurant in 2009 after extensive experience in local foods, vegetarian cooking and wellness. When you’re looking for salad options, you’ll find local, seasonal creations like the Quixote Chop made with black beans, roasted corn, pickled carrots and red onion, tomato, celery, cashew cheese, and avocado on a bed of spring mix and topped with tortilla strips. Yum! Since we talked to The Gold Leaf team after their grand opening, they’ve had huge success, then a temporary closing, a joyous reopening and, now, even more success! Because they are hyper-local, meaning they source every ingredient within about 400 miles of the restaurant, their ingredients change every week and sometimes every day. That means their salads are always driven by Northern Colorado ingredients. And, if you want to venture outside the realm of leafy greens, you can find equally healthy, plant-based options throughout the entire menu. If you’re eating at Ginger and Baker and you’re not opting for the Chicken or Veggie Pot Pie, you’re definitely missing out on one of the best dishes in Fort Collins. But, because the culinary team at this River District favorite sources local, Colorado produce, meat, fish and fowl, farm fresh eggs and honey from their own hives, you’re guaranteed a fresh and unforgettable meal every time. On The Café menu, you’ll typically find four salad options no matter the season. 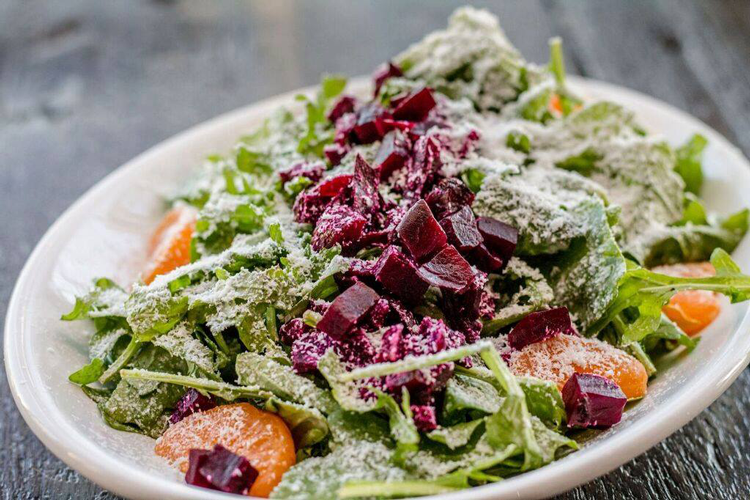 And each one features an innovative mix of ingredients similar to the Beet Salad made with roasted beets, pickled golden beet marmalade, pomegranate seeds, goat cheese and white balsamic pomegranate vinaigrette. 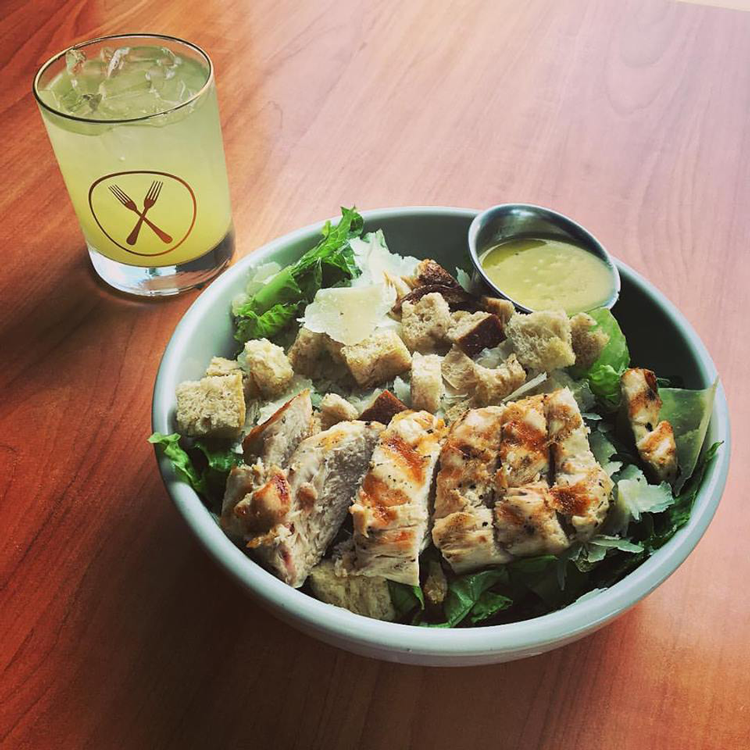 We know, you never expected to see this comfort food spot on a salad roundup, but the Union kitchen produces some of the best eats in Fort Collins whether you’re craving fried chicken or fresh greens. Every single ingredient and topping on their seasonal salads are intricately prepared with care. Some of the highlights are poached chicken breast dressed with apricot, pecanwood smoked bacon, ginger-lemon yogurt dressing and candied pecans. From the team behind Loveland’s Door 222, Locality is a beautiful dining destination with a chef-driven menu dedicated to local and fresh ingredients. The kitchen is led by Executive Chef Dryden Goss who picks up ingredients and produce himself from farms all around Northern Colorado so each dish can come together in true farm-to-table fashion. At the top of their rotating menu, you’ll find about five different salads each season, each one driven by those local, sustainable, farmers’ market ingredients. The Farmhouse at Jessup Farm is located inside a 133-year-old building complete with a ¼-acre chicken coop, a starlit patio, elevated country fare and a daily donut special. Offering lunch, dinner and weekend brunch, each menu changes for the season to reflect festive flavors and local ingredients. When you’re not there for the daily donut, you can rest assured the salads will be just as satisfying. Straight from the garden, you can enjoy selections like the Avocado Grapefruit Salad, the Market Salad and the Detox Salad made with golden beets, red quinoa, pomegranate seeds, sriracha sunflower seeds and other outstanding flavors! Inspired by old world, familial hospitality, ideals and atmosphere, Cacciatore at Heller’s Kitchen is a must-try in Jessup Farm Artisan Village. Their menu is made up of hand-crafted dishes showcasing delicious, seasonal flavors. With options to add steak, shrimp and smoked salmon to any salad, the insalate section of the menu is as delectable as the pizza section. For example, the Roasted Beets includes watercress, tomato confit, goat cheese croquette, pickled red onion, kalamata olives, candied pecan and sherry honey dijon. 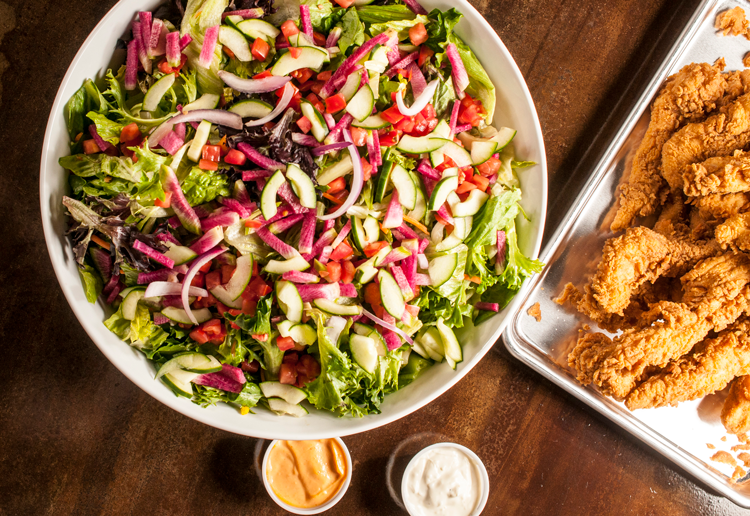 Though famous for their house-breaded chicken tenders, hand-cut fries and made-from-scratch sauces, Comet Chicken also serves up amazing salads! From the simple House Salad made with greens, radish, carrot, cucumber, tomato and red onion to the Asian Salad made with greens, edamame, radish, tomato, cucumber, red onion, bok choy and crispy wontons, their healthy options are as flavorful as their must-try fried chicken. If you have a go-to spot for salad in Fort Collins, give them a shoutout in the comments below!